Many readers of A Hundred Years Ago are participating in Grandma’s Bake-a-thon, and are sharing a family recipe story that is special to them. This Bake-a-thon is being held to give Grandma a wonderful send-off to live the rest of her life after the diary ends. On several days when Grandma didn’t write anything, I plan to reblog some of those stories. Today, I’m featuring a post by Lillian at Lillian’s Cupboard. 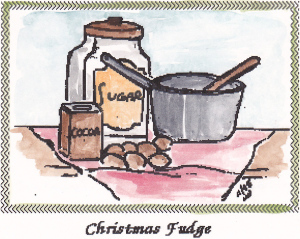 She directed me to a wonderful post she wrote about Christmas Fudge. As we watched Mother sprinkle carefully measured spoonsful over our oatmeal. We longed for a bottomless sugar bowl. To get an extra bag of sugar allotted for canning and preserving. Sweet enough to make up for a whole year of rationing. Posted on December 9, 2014 December 11, 2014 by SherylPosted in FoodTagged recipe. I wonder if she wrote down the recipe? I’m glad you liked them. I liked them, too.